Please be aware that this site has been developed for the purpose of keeping interested parties informed of the various stages and the tasks required while we are under construction. At this time we have been approved and redesignated as Business - Leisure and Recreation, however, we are not in a position to take bookings until we have a firm date for completion of construction. 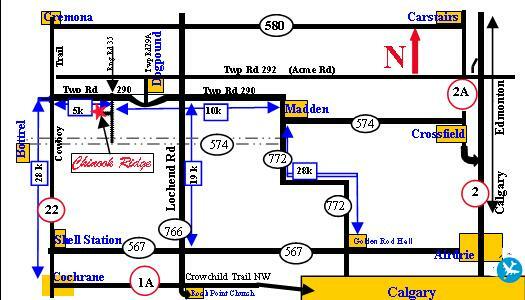 You can search in Google Maps for 'Chinook Ridge' as we have placed a pin so you can locate us easily. Allow yourself about 30 minutes to reach us from either Cochrane or Calgary. 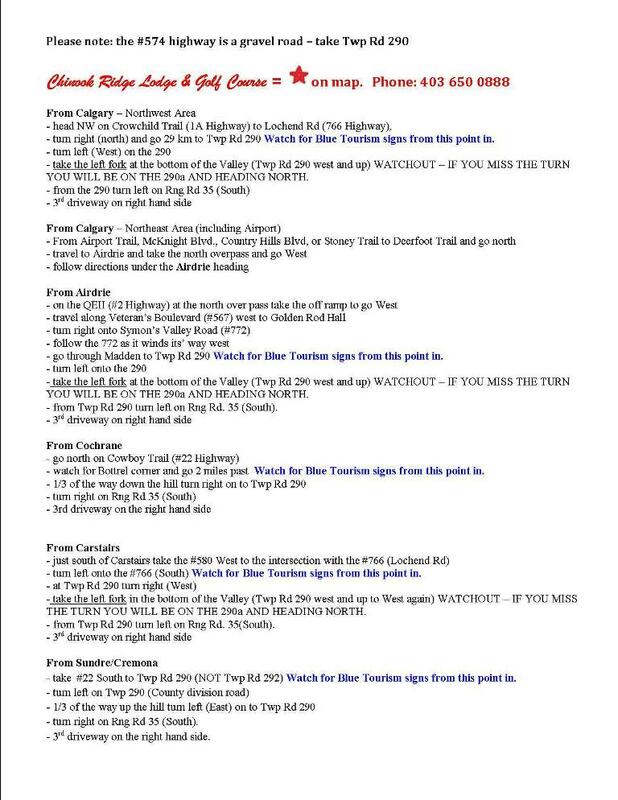 Or simply print the entire page for the map and directions from many starting points. Chinook Ridge Lodge & Golf Course is located a short 25 minutes NW of Calgary; our rural setting features a fabulous view of the Rocky Mountains. The site itself is undulating hills interspersed with clusters of trees which are home to many varieties of birds and an abundance of wildlife. If a rural setting is what you are seeking for your event - you've found it here. Use Twp Rd 290 to travel to our site, we are only .5 miles south - on gravel.